Over the last several months, the diverse roster of artists that make up the 2018-19 Rebanks Family Fellowship and International Performance Residency Program have embarked on a fittingly diverse range of projects as they prepare to launch professional careers as performing artists. The one-year postgraduate program of The Royal Conservatory’s Glenn Gould School has allowed them to play in cities around the world; explore the works of neglected and emerging composers; and collaborate with videographers on distinctive promotional content. Catching up with the 2018-19 Rebanks Fellows several months into the academic year, it’s clear that everyone is at once amazed and grateful for the program’s flexibility, the huge range of performance opportunities, and the strong community of colleagues they’ve been able to build. For pianist Kevin Ahfat, participating in The Rebanks Family Fellowship Program feels like coming home. After spending several years at Juilliard, where he completed his undergraduate and graduate studies, the program allowed the Toronto native to make a welcome return to his hometown. Ahfat was drawn to what he describes as the “exciting energy” that pervades The Royal Conservatory, as well as his ability to embark upon all manner of musical projects. One of Kevin’s passions is the development of work that merges beautiful music with arresting visuals. He’s teamed up with filmmaker Myles Chiu, with whom he collaborated on a 2018 recording for the CBC, on another video he hopes to release soon. Among Kevin’s other ‘projects of intrigue’ have been a series of North American performances with the ARC Ensemble, a group made up of senior faculty of The Royal Conservatory’s Glenn Gould School. Having the freedom to work, study, and coach with the faculty of The Glenn Gould School is something Kevin considers a privilege, particularly for someone embarking on a career as a performer. Mezzo-soprano Georgia Burashko has performed non-stop during her time as a Rebanks Fellow, though she feels she’s barely scratched the surface of the opportunities available to her. The highlight of Burashko’s year was the opportunity to perform Gustav Mahler’s Lieder eines fahrenden Gesellen (Songs of a Wayfarer) with Dutch company Introdans at the Fall for Dance North festival in Toronto. “The dreamiest gig ever,” she enthuses. Burashko lights up when she talks about another one of her favourite projects, an exploration of the music of Johann Rosenmüller, a baroque composer whose work bridges German and Italian musical traditions. Burashkho has found it incredibly satisfying to be able to work on such a wide range of artistic initiatives, many of which she wouldn’t have been able to pursue without the support of The Rebanks Family Fellowship Program. More fundamentally, the program has allowed Burashko to find her voice as an artist. In her words, the power of the program is that it allows young performers to take the opportunity to build their confidence and establish their point of view. Percussionist Nikki Joshi came to The Rebanks Family Fellowship Program with a very strong artistic point of view. 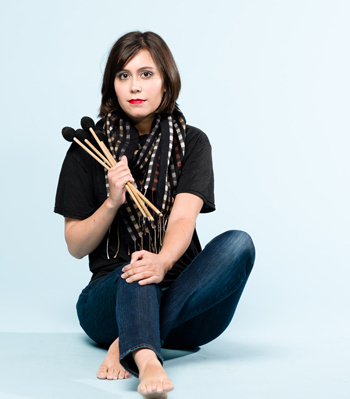 The Virginia native is dedicated to performing contemporary music, and confesses her taste tends toward the avant-garde. Joshi’s goal as a performer is to contribute to the acceptance of contemporary music and to introduce it to a wider, more inclusive audience. She was gratified to find that her vision for her career found a perfect home at The Rebanks Family Fellowship Program. Among her many interests are the works of composer Matt Curlee. She commissioned him to write a piece for her, based on Charlotte Perkins Gilman’s 1892 short story The Yellow Wallpaper. Because of the program funding, Joshi is currently touring the work at venues across North America. Brimming with boisterous enthusiasm, violinist Danny Koo says applying to The Rebanks Family Fellowship Program was the best decision he’s ever made. As is the case with many of this year’s other Rebanks Fellows, Koo is struck by the wide range of musical projects he can pursue, as well as the incredible amount of support he receives to complete them. “You can curate whatever kind of project you want,” says the Chicago-born musician. 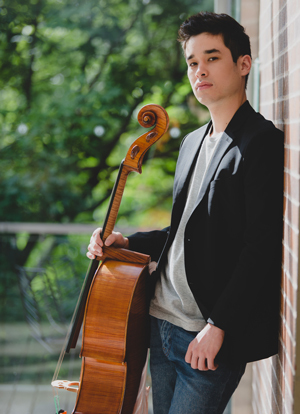 He’s currently working with Riddle Films to record Bach’s chaconne for violin and singers, and is collaborating with Korean rapper Lafic on a striking series of promotional videos. Most recently, Koo released his first mini-album, amusingly titled Danny Boy. Koo also credits the program for enabling him to play for his heroes. He was one of several Rebanks Fellows sent to the Lunenburg Academy of Music Performance, where he performed for legendary violinist Gidon Kremer. For Australian cellist Richard Narroway, participating in The Rebanks Family Fellowship Program has brought him a great deal of joy. After completing his doctorate at the University of Michigan, Narroway has loved spending this year living in Toronto, connecting with its rich community of classical musicians and pursuing projects about which he’s passionate. “I have not heard of any program elsewhere in the world created specifically to help bridge the important transitional period between the end of one’s formal training and a professional career in music,” Narroway says. Narroway is especially grateful for the opportunity to create professional recordings at CBC’s Glenn Gould Studio – “a wonderful space!” – as well as The Royal Conservatory’s own Koerner Hall. His enthusiasm about the facilities available to Rebanks Fellows even extends to the practice rooms, which he praises for their generous size and soundproofing. “I feel very fortunate to have access to such a safe and well-managed environment,” he adds. Beyond his time in Toronto, Narroway has wonderful memories of his experiences in the United Kingdom with violinist Katya Poplyansky, another Rebanks Fellow, as well as musicians of the ARC Ensemble. The trip enabled him to work with students of the Royal Academy of Music and and to perform with the ARC Ensemble at venues across the country. Having the opportunity to collaborate and coach with a wide variety of musicians in a wide range of settings has been one of the most valuable benefits of the Program for violinist Katya Poplyansky. Thanks to the support of the Program, Poplyansky has worked with Gidon Kremer and the ARC Ensemble, as well as many faculty members throughout The Glenn Gould School, and has collaborated with many more artists in venues around the world. Poplyansky believes that having access to such a diverse range of experiences makes you a better player by exposing you to the many ways a performer can interpret a piece of music. Given her interest in working with a diverse array of artists, it makes sense that Poplyansky believes in the importance of community. One of the highlights of her time as a Rebanks Fellow was her experience speaking with curators at the Art Gallery of Ontario about her role within the wider cultural sector. One of the keys to building a strong community, Poplyansky asserts, is open communication among colleagues. She is grateful to have found such a community among the Rebanks Fellows. Everyone has grown so close, in fact, that they’ve created a private Facebook group to stay in touch. It’s a sign of a strong bond that has caught Poplyansky somewhat by surprise. Israeli soprano Nofar Yacobi has met some wonderful new colleagues during her time as a Rebanks Fellow. Whether on stage, in a recording studio, or within the community, she has met people who have inspired and moved her. Yacobi also derived a great deal of satisfaction from working with the production team at the Glenn Gould Studio, where she recorded several rarely heard Israeli songs. Yacobi is equally grateful for the many performance opportunities The Rebanks Family Fellowship Program has afforded her, from concerts at the Canadian Opera Company and The Royal Conservatory’s 21C Music Festival, as well as her Canadian debut in Koerner Hall performing the Queen of the Night in The Glenn Gould School’s production of The Magic Flute. However, Yacobi holds a special place in her heart for the many outreach performances she has given throughout Toronto. Particularly stirring was her experience singing for children with complex special needs at Toronto’s Safehaven centre. “Their eyes lit up through music,” she recalls. The experience also reinforced her enduring belief about the universal power of beautiful music. Rebanks Fellows will perform a free concert in Mazzoleni Concert Hall on April 10. To reserve tickets, please visit rcmusic.com/performance.